"During a birthday celebration for the Viceroy of Peru, two street performers entertain the crowd. Too poor to marry, the performers briefly part and the girl, La Perichole, falls asleep in the park. The Viceroy sees her and falls in love. Out of practicality, she agrees to become his mistress, and writes a letter to her lover explaining the situation. Since the Viceroy’s ladies-in-waiting must be married, his henchman must find La Perichole a husband. Her devastated lover Piquillo, with the help of some wine, is convinced to marry a young woman in order to receive a title and riches. La Perichole, who has reconsidered her decision, agrees to marry when she sees that the man selected is Piquillo. When a sober Piquillo learns that he married La Perichole, he throws her at the Viceroy’s feet, an act that puts him in prison. 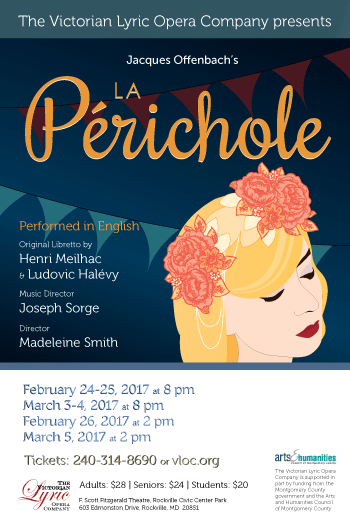 La Perichole tries bribing the jailer, only to discover he is the Viceroy in disguise. He punishes his faithless mistress by imprisoning her, too. The Viceroy is captured and the lovers escape. After a search, the lovers appear singing of their misfortune and their love, and the Viceroy releases them, awarding their promised estates and titles." (Taken from Boosey & Hawkes).